Michael Moroney is looking forward to this weekend, fresh back from a trip to New Zealand where the stable secured a number of lovely yearlings at the Karaka sales, the trainer is full of confidence leading into the autumn carnival. And he is confident that all six of Ballymore's weekend runners are major chances - kicking off with Serenade in one of Saturday's features, the $250,000 Inglis Classic at Rosehill. So impressive recording a five length victory at Canterbury last month, the daughter of Star Witness has pleased us with her progress since. "We have been really happy with her," Moroney enthused - "everything since the race has been perfect." "So long as she jumps cleanly away from the inside gate she should prove very hard to beat." Meanwhile at Sandown we saddle up three nice chances beginning with Zazparella who takes her place in the third race, the Sportingbet Handicap. Not in the best part of the track when resuming at Flemington a couple of weeks ago, the Al Maher five-year-old strips fitter for a rise in distance. "She might still be half a run away but she likes Sandown and her first up run contained merit," said Moroney. A mare who has performed well second up, Zazparella is considered a "good each-way chance." Talented three-year-old Merion resumes in the seventh race, the William Plate, and a bold showing is anticipated. "He has trialled nicely here at Flemington and the 1300m on the big track looks ideal first up." "We will ride him quietly from the gate and providing they run along a bit he should be right there at the finish." The Ryan Branighan Handicap is the final race on the Sandown card and we will be cheering on Murcielaga who has derived benefit from his last couple of runs. "I think he will be a big improver," Moroney said, happy with the five-year-old's work with the recent addition of blinkers. "He had them on once as a three-year-old and ran about a bit so we took them off - but we think he needs them now." "If he runs up to his track work he would be a big chance." Deckhand is another of our Saturday's runners, heading to Bendigo where he contests the Marong Cup. A Kilmore winner two starts ago, Deckhand really caught the eye with a fast-finishing third at Sandown last time out and he is nicely primed for the 2200m. "We have been really happy with him. He comes off a good run and this is a nice race for him." 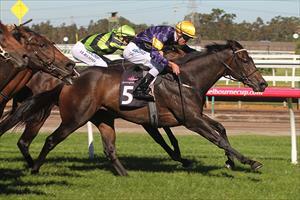 On Monday we venture to Tasmania where Garud is a leading contender in the Gr.3 Hobart Cup. "We are pretty confident about his chances," Moroney said. "I had him a bit too fat last start but we have poured the work into him and he is going very well." "Some worry about him over the 2400m but I am not one of the doubters!" "He loomed up to win the Werribee Cup and didn't quite see that trip out but that was 2600m and I think the 2400m is ideal for him. It is not a strong race this year and he should run a great race."